Let’s look at how our filters work. Since it is something I have worked with most of my life I can offer ‘abandonment’ as an example. When your core filter is around abandonment it makes you see abandonment in most areas of your life. When a friend, family or situation happens we often view it through this filter. We see a break-up as abandonment, someone upset or angry as abandonment, someone passing away as abandonment, financial difficulties as abandonment, job challenges as abandonment – do you see how ubiquitous it can become? When we are in a relationship we filter everything that happens as abandonment and this fear changes the relationship. The problem is that our partner will have a whole other filter with which they see the world. And each person believes what they see to be the truth: that their perceptions are what they are seeing in reality. However, they are seeing the world through a filter or even several filters. When we get in an argument or altercation with another person we argue because we believe we are ‘right’. Yet there is no clear definition of what is right and wrong when you have a filter perceiving each event and person. The filter in itself is skewing the result or perception. Yet we will get angry fighting our perspective and have no idea that our filter is even engaged. The fight no longer has to do with what is going on but rather on what the other person is doing to trigger our ‘abandonment’ filter. What can we do? First we need to establish what our filters and triggers are. How does our filter skew how we see the world? How prevalent is this filter in our life? How conscious are we? Then it would benefit us to be as conscious of our emotions or feelings at all times. The reason being that if we are anything other than happy then we are allowing our filters of fear to interfere with our wellbeing! On the other hand, Love can change the nature of our filters… When we give Love we open ourselves to viewing and perceiving the world differently. Love is a fascinating topic; it is the only true energy that exists. When we let go of our fears, Love prevails! It also can change our perceptions – we can clearly understand when we are not in Love and it allows us to make a choice – how would we rather BE? Love isn’t the emotion that we believe it is. Love just IS! It is the absence of fear. It resonates from our Divine Spark that connects us to our Source. It is the only energy that exists. That is why when we have fears around money, the energy of money can be restrictive. 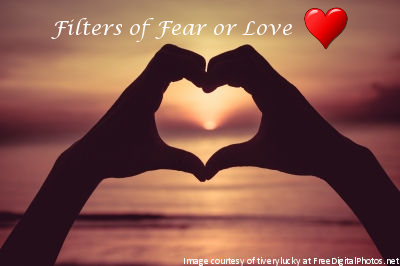 It is because our filter of fear continues to create our perceptions and this will influence how we view money and restrict the flow of energy – in this case ‘money’ or ‘money energy’. When we remember that everything is energy and energy is Love – then there are no restrictions – everything will flow. When we are conscious of our thoughts, feelings and emotions then we can make a choice – do you want to experience the world through your fears or through Love? We can BEcome present and aware each moment we are expressing through our filters of fear and being present and aware means we can then choose to Open to the flow of Love instead. Love flows effortlessly. Fears change how we see the world. Obviously we would all prefer to have life flow without restriction and the only way this can occur is by remembering that we are in charge of how we respond to situations and people. When we feel ourselves in a perpetual loop of our underlying filter of fear we know we are restricted and not seeing the world clearly. On the other hand, if we can feel this loop we can make another choice. The brilliance of life is that we can always make another choice. I choose to BE aware of the filters that focus on the fears that I have chosen to work through in this life. I choose to hold space by opening up to the Flow of Love that is ever present, at all times. I choose Love. This entry was posted in Blog and tagged abandonment, BEing, Clearing and Healing Techniques, consciousness, Divine Love, energy clearing, Filters of Fear, Intuitive Counseling, intuitive counselor, Laurie Huston, Love flows Effortlessly, present moment awareness, triggers, Views of the World. Bookmark the permalink.